Articles So, You Want A Litter? So, You Want A Litter? "To make a lot of money." Do you realize the expense involved in such items as advertising, veterinarian bills, stud fee (if you do not own an intact male and IF, you can find another breeder that will allow you to use their stud cat), food, etc., to name a few? "Because it would be good for the children to watch the birth and play with the kittens as they grow up." Actually, the "gory" parts of the birthing repulse most kids, who are all too anxious to just skip the viewing of the miracle of birth you have planned for them to see. And a litter growing up is too rowdy for most kids who are usually totally disinterested or absolutely terrified of the leaping creatures with the sharp nails and teeth. If you want the kids to see a kitten grow up, it's usually better to buy one. "Because we love Princess and we want one just like her." The chances of getting one "just like her" are very slim. "Because everyone who comes to the house and sees Princess wants a kitten when she has a litter." Just wait until your litter of eight is ready to go to their homes and watch all those people back out with excuses like...."The kids aren't old enough.".... "The kids are too old now to be bothered with caring for a kitten."...... "We are going to have a baby.".... "The rug is too new.".... "The house is too small.".... "We'll be moving in 3 months."..... "Grandma doesn't like kittens.".... "Our old pet hasn't died yet."..... "It might not get along with the cat. ".....and the list goes on and on! "Because we really love little kittens." You'd better be sure you love them. You can't fully imagine how much is involved, such as the mess a litter makes. Can you put up with the cleaning that is constantly needed in caring for the litter? There is no way to explain how tired you get of scrubbing up after the kittens, their birthing box, a spare bedroom or wherever they are kept. They dump their food and water the minute you put it down, step in it, and drag it through whatever else may be in the kitten box, and with 6 or 8 or 12 kittens, there's always something else to be cleaned up too! Do you understand the RESPONSIBILITY you will have with a litter? It's not just Princess having the litter and caring for it until they are ready to go. Most of it is up to you and you're tied to the litter like any new mother, only you can't take the litter with you to your in-laws for the weekend, or any place else for that matter, so you'd better be content to spend the next 12 weeks tied to your home, because you have to be there to feed the kittens four times a day. Now that you have some idea of what is involved other than playing with those cute, cuddly kittens and are still determined to breed, here's something else that should be considered. Is your queen (dam) of QUALITY to breed? Do you know her faults as well as her virtues? Does she meet the standard of the breed as set forth by a recognizable registry such as CFA (Cat Fanciers' Association)? Is she in good health? Has she been tested free of the genetic defects associated with the breed (i.e., polycystic kidney disease)? Do you have customers so you won't have to sell the kittens at a price below market value or take them to a shelter? Get an opinion of your queen from a few responsible breeders. Find out what they think are her faults and her virtues. Learn about any problems that exist in your breed such as PKD1 (polycystic kidney disease), heart disorders, etc. Study the breed standard yourself so that you are familiar with it when looking at and evaluating possible stud cats. Get several reputable breeders' opinions of a stud cat that will enhance your queen. Go to see as many of the stud cats and their offspring as you can. After you have decided on a stud cat, take your queen to the vet and have all necessary health clearances done ($$$$). She should have a general health check-up and the vet will let you know if any vitamin supplements are necessary. This exam should include: a worm check (take along a stool sample), a heartworm check, updating of vaccinations, blood panel. Don't forget, all this is going to cost money, but it is necessary, part of planning for a healthy litter. Now while you wait for her to come into season, read all you can on your particular breed, breeding, queening, and rearing kittens. Do you have a place that is quiet, away from other pets and traffic of the household for the birth to take place? Have a queening box built or, if you are handy, build one yourself. More $$$$. When the queen comes in season, contact the stud cat owner with whom you have previously made arrangements regarding the breeding. You will be advised on when to bring your queen. Plan to pay the stud fee at the time of breeding ($$$). There may also be a boarding charge if your queen is to stay with the stud cat's owner ($$$). Be sure you understand in advance what the payment of the stud fee is guaranteeing. The suitable stud for your queen may be some distance away involving additional traveling expense ($$$). Getting your queen bred isn't always as easy as you might imagine and may require repeated trips to the stud cat. After your queen is bred you have about 63 more days to do more reading and thinking, and laced with the good thoughts about the precious darlings will be some horrible thoughts about what can go wrong and how much it will cost you, both financially and emotionally. We hate to keep dwelling on this, but things DO go wrong occasionally and you should be prepared in case it happens to you. (1) What if your queen has problems and requires a Cesarean section or other extensive vet services ($$$)? (2) What if the kittens die? (3) What if she is not pregnant or has a miscarriage? (4) What are you going to do with 10 six month old kittens that you can't sell, give away, or have the heart to put to sleep? Do you have adequate facilities? (5) What if your queen can't or won't nurse the kittens? Are you prepared to feed them every two hours for the next three weeks? (6) And worst of all, what if Princess dies while queening or afterwards? Will it have been worth it? The days pass, and Princess has her kittens without any problems, but you still have to take her to the vet to be checked over within 24 hours of delivery. Some veterinarians may suggest that your cat get injections to prevent infections or to make sure there are no more kittens that have not been born. ($$$) Lucky for you, Princess has had 10 healthy kittens. They are almost six weeks old now and in six weeks it will be time to sell them. First they will all have to make a trip to the vet. Their check-up will include shots and a worm check with medication if necessary (10 x $$$). (2) The next best male has a bad bite. (3) The really pretty female has a bad bite. (4) The smaller female has a proper bite but she is too long (does not have a cobby body). (5) There are four who are average, nothing really wrong but nothing outstanding either. There is one who is show quality. The "show quality" one is the one you were going to keep just as a pet because the kids liked it best (another mouth to feed $$$) and you're feeling down at the breeder's opinion of your litter. But you're told to cheer up, one outstanding kitten is better than a lot of people get out of a litter and you should consider this a successful breeding. Some consolation when you were going to sell them all as show kittens! Now you have your litter graded and priced accordingly and you are ready to sell them. By this time, are you knowledgeable enough about your breed to be the expert every buyer assumes you are? Are you prepared to answer questions on litter box training, feeding, grooming, bathing a long-haired kitten, etc.? Are you prepared to answer these questions not only at the time of purchase, but months later or when someone calls at midnight because the cat isn't eating right? Can you direct buyers to the appropriate sources to help them get into showing, recommend a vet, etc.? Remember, you are now the breeder and the responsibility doesn't end when a kitten is carried out the door. Do you have a pedigree ready to go with each kitten, as well as the registration forms? Are you prepared to advertise extensively ($$$) if needed? 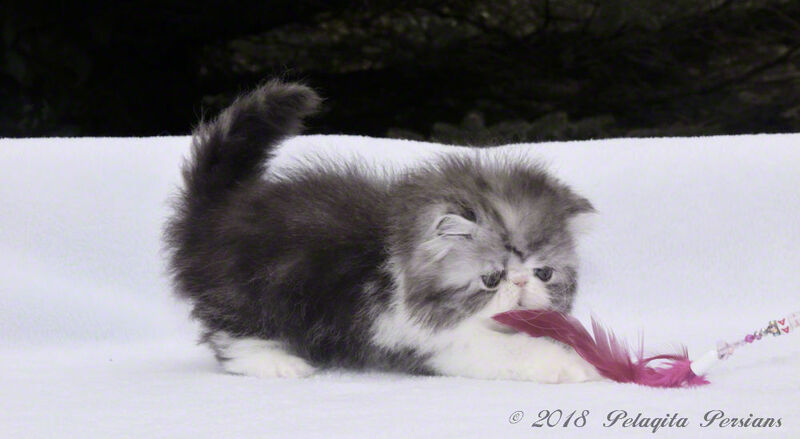 If you have a good queen and have bred to a stud cat owned by an interested breeder, they may send referrals to you, but don't depend on others to sell your kittens, and advertising expenses can really add up. Don't expect the buyers to flock to your door the day the kittens are ready to go. It may take weeks, or even months, before they are all sold. This results in lots of food costs and more trips to the vet ($$$). We hope that if you breed your queen you do it the right way and only for the right reasons and put lots of time, thought, and love into your decision. THERE ARE TOO MANY UNWANTED KITTENS PUT TO DEATH EACH YEAR DUE TO IRRESPONSIBLE AND IGNORANT BREEDING. DON'T LET ANY OF YOUR KITTENS END UP THIS WAY.